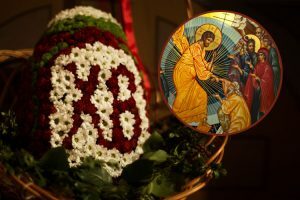 Pascha should be a beginning rather than an end. We are so accustomed in our culture to spend all of our energy on our preparation for an event and then when the event occurs, we relax and "take a break." 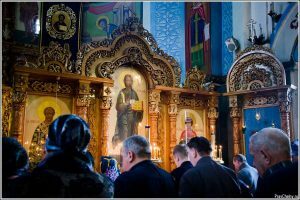 Well, within the life of the Church where we participate in Christ Himself every feast, every Liturgy is a beginning, a renewal, a rebirth into Christ. This is why we feast Pascha for forty days and then await the coming of the Holy Spirit. So we see that we must continue in this paschal victory during this whole season and into all of our life. Pascha should be a beginning rather than an end. We are so accustomed in our culture to spend all of our energy on our preparation for an event and then when the event occurs, we relax and “take a break.” Well, within the life of the Church where we participate in Christ Himself every feast, every Liturgy is a beginning, a renewal, a rebirth into Christ. This is why we feast Pascha for forty days and then await the coming of the Holy Spirit. We begin to enter into Kingdom time where we begin to see all of our life transformed into the presence of the Holy Trinity. 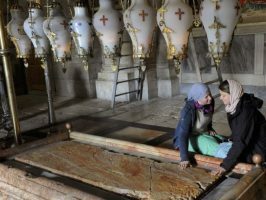 Our sin, death, impossible situations, disappointments, struggles, losses, start to shine somehow with the light of Christ who shone forth from the tomb. 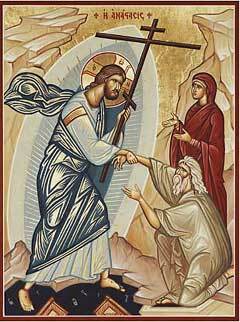 This is where the light of Pascha begins to dawn in our hearts. St. Makarios of Corinth developed this idea and we find in a wonderful paraphrase of one of his homilies elaboration on this theme. “When you hear that Christ descended into hell in order to deliver the souls dwelling there, do not think that what happens now is very different. The heart is a tomb and there our thoughts and our intellect are buried, imprisoned in heavy darkness. And so Christ comes to the souls in hell that call upon Him, descending, that is to say, into the depths of the heart; and there He commands death to release the imprisoned souls that call upon Him, for He has power to deliver us. Then, lifting up the heavy stone that oppresses the soul, and opening the tomb, He resurrects us – for we were truly dead – and releases our imprisoned soul from its lightless prison… What was the purpose of His descent to earth except to save sinners, to bring light to those in darkness and life to the dead?” So let us feast Christ’s resurrection continually for today Christ is risen and “not one dead remains in the tombs.” Christ is risen! Indeed He is risen!